Sick of sausages? Try some of our exciting barbecue recipes that make the most of seasonal ingredients. From homegrown tomatoes to young leeks, homegrown vegetables are the stars of our barbecue recipes. Grill some fresh tuna on the barbecue and you have the beginnings of a romantic summer supper. Add a light potato salad and some just-made salsa, and it’s a seasonal feast. First make the salsa and potato salad. Finely dice the cherry tomatoes, coriander and spring onions. Stir them together with the juice of ½ a lime and a pinch of sugar, if the tomatoes need it. Season and set aside to let the flavours blend. Boil the new potatoes gently until just tender. While they’re still warm, add the shallot and chives. Whisk together the oil and vinegar and pour this over the potatoes. Season generously and taste for balance. 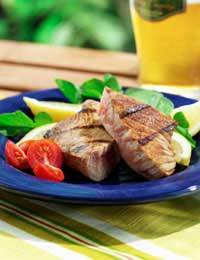 Finally, prepare the tuna steaks: brush your barbecue grill lightly with vegetable oil and, when the coals are white, slap the tuna onto the grill. Cook the steaks for 2-3 minutes on each side, until done to your liking. Serve the barbecued tuna steaks with a spoonful of salsa and a side of new potatoes. The first baby leeks appear at the same time as asparagus, in May. If you grow your own, you will probably want to enjoy them on their own as a speciality. So make the most of both by preparing this delicious dish, which can serve as a side dish or starter. The Hollandaise sauce is easier to make than you might think! First make the Hollandaise: put the vinegar with the peppercorns in a saucepan. Bring it to the boil and simmer until it’s reduced to about 1 tablespoon. Set it aside to cool. Put the egg yolks into a blender and add the cooled vinegar (without the peppercorns). Put the butter into the cleaned-out saucepan and melt it, then start the blender. When the egg yolks are beaten, start dribbling in the butter slowly; stop before you add the butter solids (the white particles in the pan). Thin the sauce with water if necessary, and add the extra lemon juice if it needs sharpening up. Put the sauce in a warm dish while you barbecue the leeks and asparagus. First blanch them in boiling water: drop them in and wait for 30 seconds before removing. Then toss the vegetables with the olive oil to coat them. Spread them on the barbecue grill and cook for 5-10 minutes, until griddle lines appear and the spears and leeks are tender. Serve the barbecued asparagus and leeks immediately with the Hollandaise sauce drizzled generously over the top!